Floral Mood Dish, Pale Green - 4674 Discounts Apply ! A flawless dish, with hand-painted floral design and gold trim. 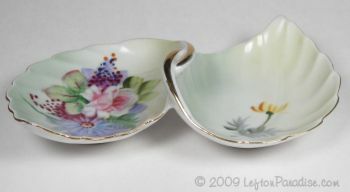 The dish measures 6½ long and is marked 4674 with a Lefton gold crown logo and Lefton sticker.